Dallying In The Dirt, Issue #201--- The Begonia leaf cuttngs have plantlets growing. Here we are in a the new year, it’s time for “Dallying” #201, and I’m excited about the garden already. Amazing things are happening in the basement. You may remember a few weeks ago I was experimenting with my Rex Begonias. I took a few leaf cuttings in a variety of methods and I have been faithfully keeping them moist and warm ever since. This week I looked and a couple of them are sprouting little plantlets. It’s very exciting. You can see in the picture that it is a real little plant with several leaves that starts up. It will be interesting to see how quickly it grows into a full sized plant. I rushed upstairs and started taking several more cuttings, now that I’m sure it works. Hopefully we will have enough good sized Rex Begonias to fill up all the shade pots beside the garden gate. They did so well there last year. Both the laying flat and the standing up method have produced these wonderful little plants. How big do I let them get before I transplant them into their own little pots? Less exciting, are the Coleus that are staying alive under the lights. They are not flourishing and I have upped the fertilizer and that seemed to help a little bit. I was just reading my press releases from the National Garden Bureau and was happy to discover that Coleus has been named the plant of the year, in the annuals category, for 2015. 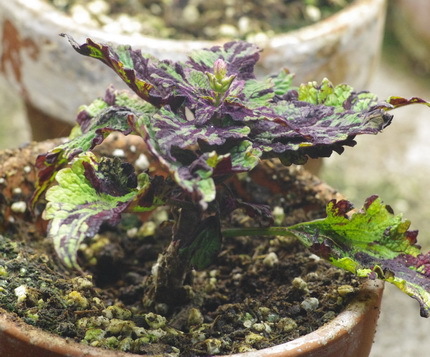 Reading further into the information, I discovered that Coleus do quite well as indoor plants during the winter but that they like a temperature of at least 21̊C (70̊F) and they certainly aren’t getting that in the basement. A little reorganizing of the warm spot in the solarium and they will be moved there to see if that makes a difference. 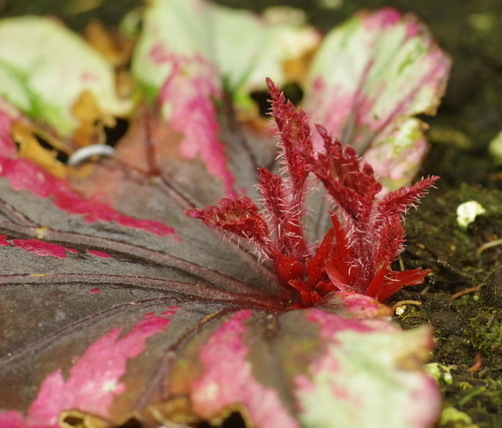 Coleus are also fairly easy to grow from seed and there is a huge selection of colours and leaf shapes available. They did extremely well in my porch planters, where they got no direct sun, last year and I wanted to repeat them this year. Hopefully the change in temperature and some natural light will rejuvenate these sleepy heads. If It’s time to start planting seeds then there is a very important job to do before we open the first seed packet. Damping Off is a horrible fungus disease that can wipe out a tray of seedlings over night. There is no cure. By the time you notice it, the seedlings have fallen over and are dead. Prevention is primary. All of the trays, cells, tools etc. that we are going to use to start those seeds must be cleaned and sterilized. 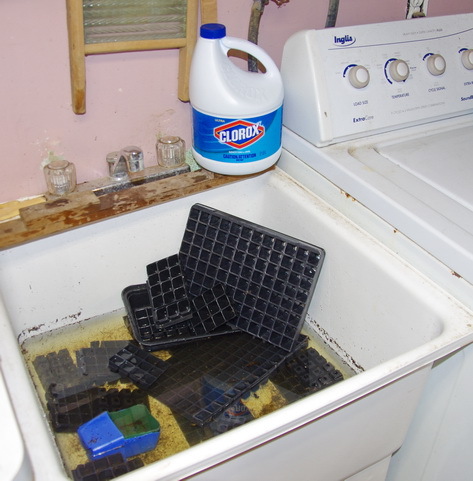 Mine go in the laundry tubs, the Assistant Gardener is not that excited about this process, to soak in some hot water and bleach. When all traces of old soil are gone, they get air dried and then we are ready to start sowing some of that precious seed. Of course we use a sterile soilless media to start all of our seeds. Thank you to all of my readers who wrote expressing hopes and prayers for my granddaughter Matilda. She remains in the hospital and is progressing, albeit somewhat slowly. We hope to have her out in time to help plant the garden early this spring. I do enjoy winter but getting her brothers in and out of car seats while dressed in snow suits is not one of winter’s best parts. Angela Asks? I have a peace lily that I'm trying to save for my friend. There were 3 plants in the pot and I repotted them(2 small ones and the large main plant). I water 1-2 times a week to just to keep the soil moist or they will droop. I do see new growth on the plant once in a while. The older leaves will begin to turn brown then black. I have the plants in my living room but not in direct sunlight. My question is how can I make them happy? They don't look that way. Is it a slow growing plant? Should I be giving them plant food? Any suggestions will help. Ken Answers! Spathiphyllum sp. is a very good house plant. It does wilt the moment it needs water but your transplanted ones will slow down their water needs as they develop more roots. They do grow quite slowly and they certainly will at this time of year when we are lucky to see 6 hrs of sunlight. They do very well in low light but might appreciate a brighter spot after transplanting or at this time of year. The oldest leaves will always turn brown and die as new ones develop. Nothing lives forever. Enjoy . Susann Asks? What do you do with used oasis, is it garbage, compost or can you break it up and mix it in to planters?? I have a huge Mop Top Hydrange bush, if I dig it up, chop it in half, will it transplant well?